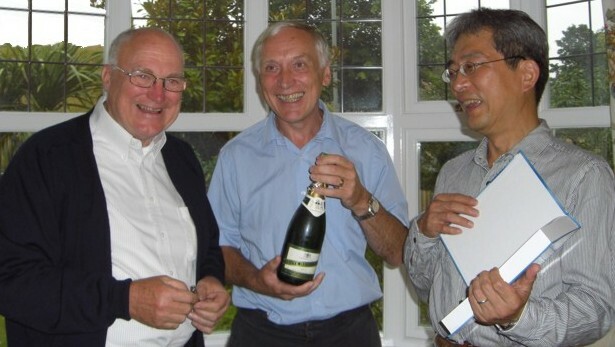 The HSPiP team, from left to right: Dr Charles Hansen, Prof Steven Abbott, Dr Hiroshi Yamamoto. Professor Steven Abbott runs his own company Steven Abbott TCNF Ltd and is a specialist in writing software that captures technically complex issues and enables real-world users to reach practical solutions to complex problems and he consults on coating, nanosystems, surfactants and formulations. He is also Visiting Professor at the School of Mechanical Engineering, University of Leeds. He has a PhD in Chemistry from Oxford University (but did the work for it at Harvard University) and has worked extensively in the coating and printing industries. His current interests include environmentally safer solvents for the printing industry, bio-mimetic nanosurfaces, nanoparticle dispersions for high-performance coatings (see his latest book co-authored with Dr Nigel Holmes, which uses HSP theory: Nanocoatings: Principles and Practice) as well as the continuing development of his technical software and many free scientific apps on surfactants, diffusion, adhesion etc. at AbbottApps. Dr Charles M. Hansen is in a state of active semi-retirement working from his residence as consultant and author. He holds a B.Ch.E from the University of Louisville, an M.S. from the University of Wisconsin, and lic. techn. and dr. techn. degrees from the Technical University of Denmark. He has worked extensively with numerous organisations in the coatings, plastics, and related industries with employment by PPG Industries in the USA, and the Scandinavian Paint and Printing Ink Institute and FORCE Technology, both in Denmark. Dr Hiroshi Yamamoto is a senior researcher at Asahi Glass Corporation. He has a PhD from Nihon University “Molecular design of CFC alternatives using Chemo-Informatics” and has been a Visiting Associate at CalTech. His expertise includes neural networks and data mining for thermodynamic and chemical properties. His massively popular Pirika site features many chemical properties calculators. The Pirkia HSP pages provide many exciting insights into HSP thinking. Although HSPiP is developed continuously throughout the year, the annual HSPiP Developers Conference always features furious debate between the three of us. We are very different people with very different backgrounds so we see the same problem in a different light. The aim of the debates is to get to the right answer. We don't care who is right, just as long as we think/know/agree that the answer is right. As the photo suggests, we are also very good friends and the debates always cease when it's time for champagne.